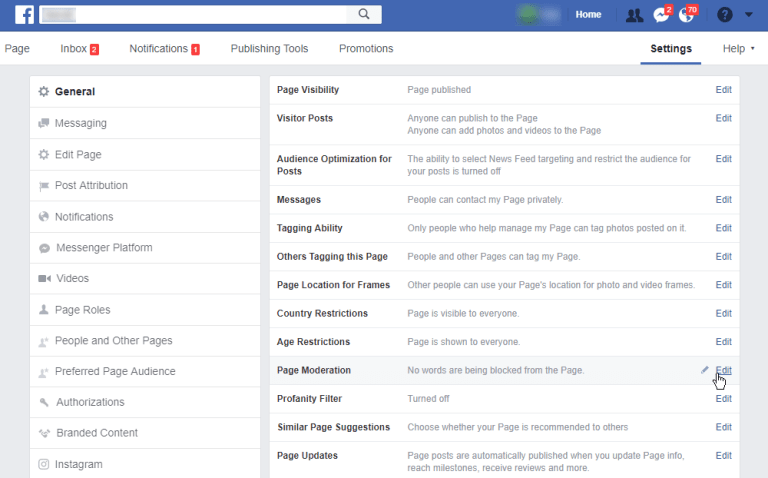 Disable Comments on Facebook Page: Today our topic is related to the most famous social platform that is facebook; we are going to talk about “how to disable comments on a facebook page”. Well on facebook there is no as such limitation for the number of followers for an individual page. And thus, unlimited number of people can comment on a post, picture or video. But for an account it has an option of not more than 5000 followers. So in order to maintain and simply things people or pages usually disable the comment option. This helps in eliminating the chaos and problems which could have been created by the followers. For knowing how to disable comments on a facebook page you will have to stay with us and keep on reading the post. Though there is no specific or direct feature through which you can hide or disable the comments form a facebook page. But you can do that in an alternative way. And the other way is that being an admin of a facebook page you have all the rights and power to block certain words. And after blocking those words you will not receive or see the comments which have those words. It is a kind of filter and not an in–built feature. Let me explain this feature with an example so that you can understand it more clearly. For example: you want to block a word and that word is “stupid”, so what you have to do is that you will have to type “stupid” in the filter list and then all the comments carrying the word “stupid” will automatically disappear or we can say will not be visible on your facebook page. Similarly for all the unwanted words you do not want to see on your facebook page, you can type fill or add them in the filter list. There is no particular limitation to the number of words you can add in this list. Now let’s talk about what happens to those comments which have the unwanted words. Well all the comments carrying those blocked words will appear like this “…..” for you as well as for the other viewers. But the person who has created that comment will be able to see it in the original manner or format. In case you want to read the hidden comment you can read that by clicking on “…..”You can also hide them from the public. Now the question comes how to exactly use the filter and hide the comments. For knowing that just have a look below! Scroll down! We are now going to tell you about how to use the filter or what steps are required to be followed by you in order to disable a comment from your facebook page. Read each and every step carefully. 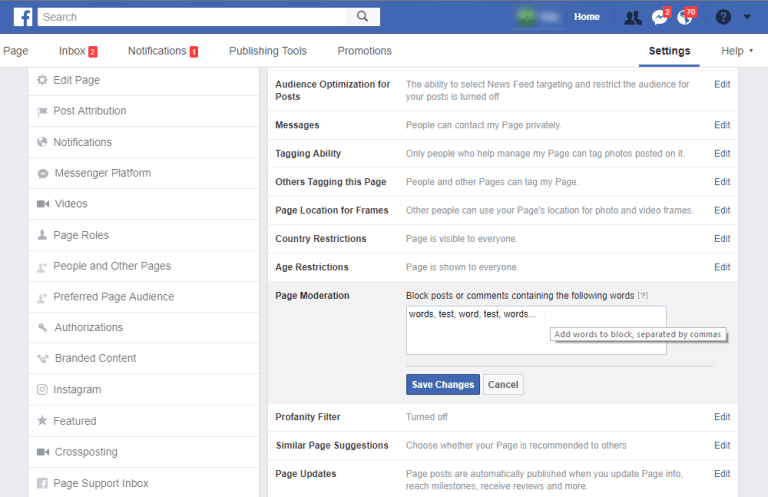 First of all you will have to open the settings which will be appearing in the upper right of your Facebook page. Click there and go to the settings. Now, what you have to do is that from there you will have to go to the General tab. After that you have to see the section titled Page Moderation. After that you will have to edit or make some changes so just click on the Edit link. After following the above step, a box will come on your screen which should already be containing some unwanted and blocked words. In case there are no such words in the list or appeared box, just add them on your own. There are two ways through which you can enter the words in the list. One is simply by typing and the other way is through uploading a .txt file containing the list of all the banned words. So this is all what you have to do and you are done! Simply the most important and main motive of using such kind of filter is that you are keeping all those abusive and bad comments away from your page. Your page remains clean and out of any sort of controversies.The drawback is this impairs every approaching remark, in the event that you have a major rundown of catchphrases. You can’t debilitate remarks for particular posts as it were. You’ll need to peruse remarks in a steady progression to choose which ones you need to appear. One more drawback is that this filter is not applicable for personal profile pages and for facebook groups. This was all about how to disable comments from your facebook page. Hope we have made you clear with everything. For any kind of feedback you can leave a comment in the comment box below.